Hair weaves don't tend to come in true curly textures (as in curls that look like springs or ringlets) due to the fact that the hair is attached to a threaded cord at the top. So instead of curly textures you get loose waves that resemble curls when the weave is box fresh. 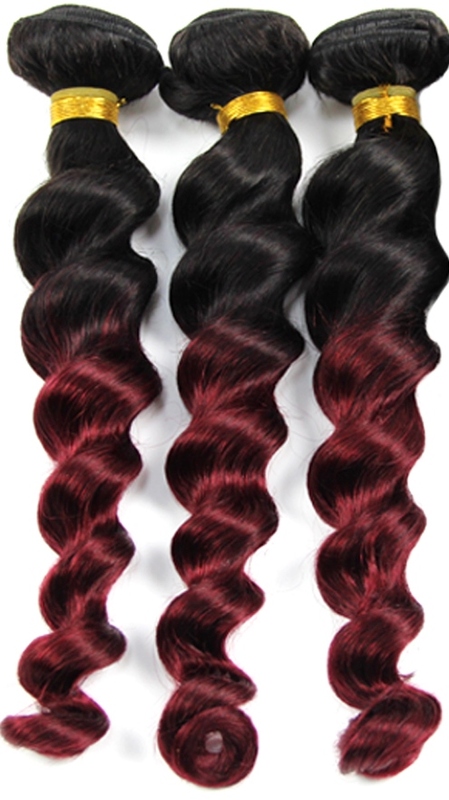 Once you unravel the weft and comb the weave hair, the curls disappear and you're left with loose waves. Who Can Wear Loose Wave Hair Weaves? Much like the beloved body wave texture, loose wave can be worn by everyone. It's an all-inclusive texture, so whatever your natural hair texture, you can wear this weave with insouciance. As the loose wave texture has been achieved through perming the hair, you might find that different retailers stock different loose wave patterns due to rods of different diameters being used in the perming process - but all end up with luscious loose waves. You can solve the mystery of weave hair beyond 30 inches, you just have to keep looking at all the evidence and it will lead you to them. Seasoned weave wearers will know that as well as raw hair, you can buy remy weave hair and non-remy weave hair, but you might not know that a face in town is the so-called tangle-free non-remy hair... (it's true, we saw it first hand). You might ask why anyone would want weave hair of different lengths, and if you did, the answer would be that this can make a difference if you're aiming for a layered look or one overall weave hair length (the guide about how to make a wig from weave hair does a brilliant job of showing how different lengths can be used). Here's where we outline colours for weave hair like someone reciting the periodic table, so get ready.... deep breath....OK, OK we won't go through the entire spectrum of colours available for weave hair, but we will mention a few. There are the familiar and friendly faces of black, off black, dark browns, chestnut browns, honey browns, honey blondes, caramel blondes, strawberry blondes, platinum blonde, coppers and auburns. As well as those there are perhaps the less familiar but equally as friendly faces of greens, dip-dyes, pinks, grey, ombre, pastels, T-colours, blues,highlights and many others. You can peruse Peruke’s Caring For Weave Guide and get going with these five top tips to get started. 1. Wash your weave hair and either use a leave-in conditioner or deep condition. Ideally, a shampoo for chemically treated hair should be used. 2. If you've gone to all the trouble of buying loose wave weave hair, then try to limit heat straightening as frequent use can sometimes distort the wave pattern. 3. Use a light moisturizer that's free from mineral oils to keep weave hair moisturized. 4. In the event of dry ends use hair oils on the weave hair (apply to damp hair). 5. If you have glue-in weave hair then it's best to use a dry shampoo and avoid getting any hair extension products anywhere near the glued tracks as it can cause the glue to disintegrate and which could mean the weave hair comes loose. A lope through loose wave weave hair done! There's always more to find out so check the Hair Extensions Q&A section or be the first to read the next guide about weave hair, wigs, hair extensions and hairpieces by joining our blog.